Flight attendants sure are masters of many talents. Apart from making sure that passengers are comfortable, serving food/beverages and taking care of the safety protocols, they do many amazing things. Like rapping safety instructions on-board the aircraft or even giving them a hilarious twist. 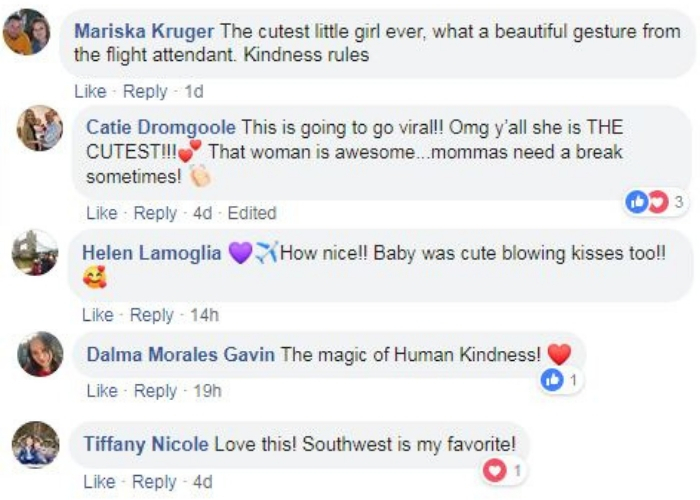 This flight attendant named Jessica aboard a Southwest Airlines flight helped out a passenger by calming down her crying toddler and carrying her whilst completing her cabin duties. Soon enough, the baby started enjoying being in the flight attendant’s arms and even blew kisses to other fliers. The adorable video quickly went viral with everyone applauding the flight attendant’s helpful and kind nature. In times where many people feel irritated or annoyed by babies on flights, with some even suggesting that they not be allowed in certain areas or ‘quiet zones’, Jessica proved that sometimes lending a hand to the tired parents is all it takes.